Elvira tries her hand at being an artist in a variety of mediums. Also, Breather presents the Mistress of the Dark with The Publisher's Wet T-Shirt Contest Award. Elvira shows off her bilingual skills and cracks open her box of old love letters. Elvira mocks Roger Corman classic "The Terror" until she falls asleep. 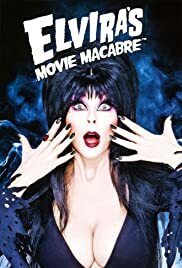 An old-fashioned style horror movie marathon, hosted and commentated on by the Mistress of the Dark herself, Elvira. This 1984 Halloween celebration is hosted by Elvira, with guests John Carradine, Laraine Newman, Todd Rundgren, and Cheech Marin. Contestants vie to become the next campy, late-night horror movie queen Elvira, Mistress of the Dark. Elvira hosts a show about creepy creatures in the world. A hosted series of horror, thriller and science fiction movies direct to video; with Cassandra Peterson as Elvira, the series host. A hosted horror movie show with Cassandra Peterson as Elvira. And I remembered also on hulu watching a show called "The next Elvira" or something, and I said to myself, well if this was filmed now... is this the next Elvira...? She sure looks like Elvira, and acts, and talks like her... so given that... I didn't get it... so I came on here, and to my shock this was a 2010 series (rather than a late 80's rerun), and it IS Cassandra! That's awesome! Geez I have never seen a celeb who retained her feminine beauty like Elvira has, I mean... I have seen some who look *almost* like they used to, but this is the first time I've seen a celeb who still looks *exactly* like she did in every conceivable way... LOL... Man, I'm so glad it was her and not someone new - no one could ever replace the real Elvira on her own show.